In a previous blog about the 10 most influential computers since 1940, we focused on many “firsts” in computing: the first programmable computer, the first electronic computer, the first stored-program computer, etc. One “first” that’s missing from our list is the first commercially-available desktop computer. Today’s blog will focus on just that, the first commercially-available desktop computer, which was the Programma 101, released in 1965. The company that made the Programma 101 was Olivetti, an Italian business that had been manufacturing typewriters since 1908 and adding machines since 1940. Olivetti released the first electronic computer designed and manufactured in Italy, the Elea 9003, in 1959. 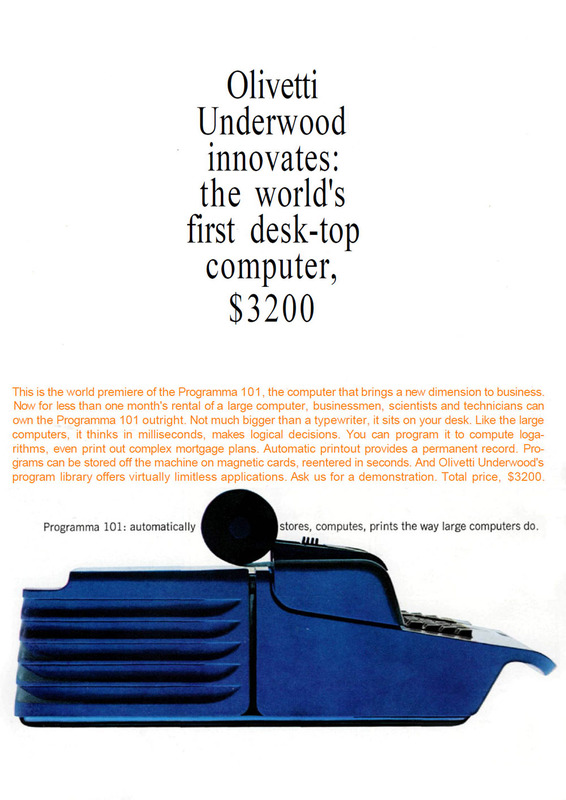 Though it sold its electronics division to General Electric in 1964, the company continued to develop the Programma 101, introducing it at the 1964 New York World’s Fair and then bringing it to market the following year. Around 44,000 of the computers were eventually sold worldwide, at a price of $3,200 (over $20,000 in today’s dollars). The Programma 101 weighed around 65 pounds and was about the size of a typewriter. It had 37 keys, a decimal selector wheel, a built-in printer, and 240 bytes of internal memory. It could perform additions, subtractions, multiplications, and divisions, and could also calculate numbers’ square roots and absolute values. The Programma 101 also had the ability to store programs to cards that were made of plastic with a magnetic coating on one side. Notable uses of the Programma 101 include performing calculations for the Apollo 11 moon landing and calculating coordinates for B-52 bombing runs during the Vietnam War. 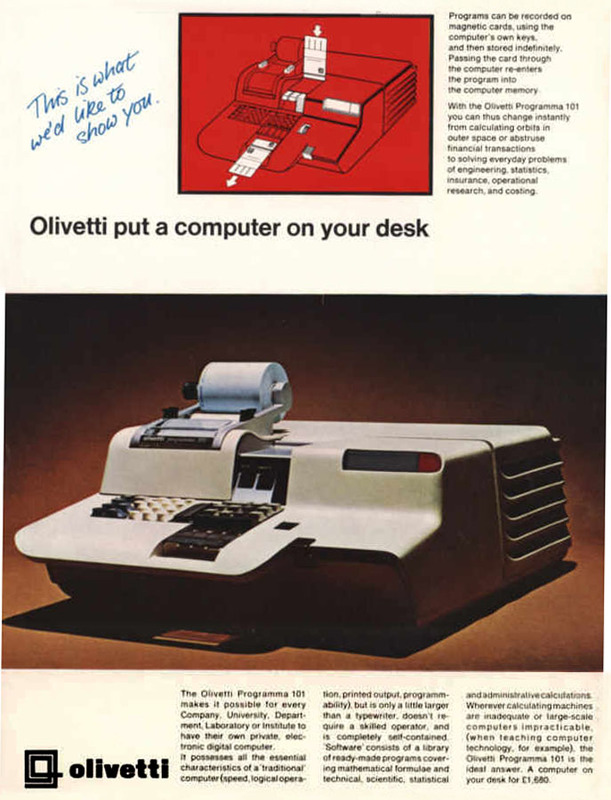 Olivetti continued to design and manufacture computers after the success of the Programma 101. In 1983, it released the Olivetti M24, which was Europe’s top-selling computer in 1986. The company eventually sold its PC division in 1997 and in 2003 it became part of Telecom Italia, where once again they began manufacturing and selling computers (along with tablets, smartphones, printers, fax machines, and calculators).